This post is inspired by a class called Motivating 21st Century Learners at Syracuse University. I’ve included a number of links to articles and video clips about games and gamification throughout the post so that you can explore this topic further. At left: My team’s game creation, a spin-off of CandyLand to facilitate learning about the resources available in an elementary school library. During our spring residency, my fellow students and I engaged in a number of rapid-fire team activities. My favorite activity was game creation. We discussed games as learning tools, and were introduced to the usefulness of games in the library environment, as well as the gamification of curriculum (which I’ll save for another post). For this game activity, we were asked to consider the elements that make a “good” game and, once we’d decided what those were, we divided into three-person teams to create a game. The game needed to be engaging, to include clear rules and a clear objective, and address specific learning goals. I can’t remember if we had twenty or thirty minutes to create our game, but it seemed an impossibly complex task in those first few brainstorming moments. Teammates Jane, Jocelyn, and I decided a game for early elementary students would provide the opportunity to infuse some fun and color into our afternoon. 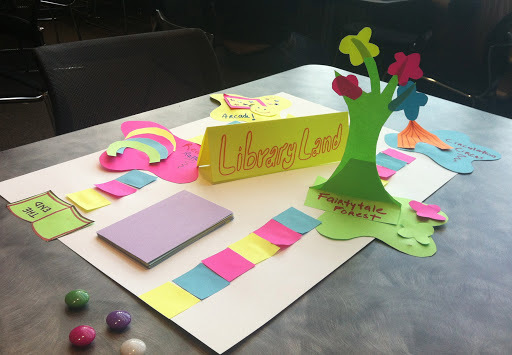 We used Candy Land as a model to create a game to help young students learn about the layout, resources, and services found in their school library. If you aren’t familiar with the game, Candy Land offers meaningful play and learning for young children to practice counting and color recognition, in addition to basic skills like taking turns and understanding rules. The board game features pawns players move to reach the end of winding path. A player draws a card that features a colored square and moves their pawn to the next square on the board that matches that color. To add interest and an element of chance, some cards feature a destination (ex. Gum Drop Mountain, Candy Cane Forest)–players may draw a card during gameplay to directly travel to one of these special destinations. In our Library Land version, we chose to use pawns, cards, and destinations in the same way Candy Land does, with some significant differences. The cards in Library Land contain questions about basic library use and elementary level information skills. The question cards indicated whether a player would move ahead one space (for a question like “Where is the circulation desk where you check out books?”), two spaces (for which a player may be asked “Where should you go to find a Non-Fiction book”), or the card could direct a player to a special destination. The special destinations our team developed reflected the different areas found in most elementary school libraries. Our Fairytale Forest, Circulation Circus, Arcade, and Reading Rainbow represent the story time area, circulation desk, computer center, and quiet reading areas of the library. The first player to make it to “The End” wins the game and then encourages other players to finish. I enjoyed the intensity of working so quickly to reach team consensus to create a workable and enjoyable game. The number of elements we needed to consider in constructing this simple game were surprising to me. Most importantly, this exercise made me consider the ways in which we present learning tasks to students. Evidence of learning does not always need to be presented via worksheets, checklists, or verbal questioning–learning, and evidence of learning, can happen during gameplay. Which is pretty awesome for teacher librarians and students. Seizing the Teachable Moment in "What’s a Library?"